This is the most incredible year in the history of the world. Well, not quite. But as you read the "diary" of Amiasaf, a Jewish boy living in Mitzrayim, you will feel like you're with him, and with all Bnei Yisrael. You'll cry with Amiasaf, as his brutal Egyptian master torments him. You'll laugh, as Amiasaf's younger brother is forced by Egyptian thugs to drink the water of the Nile that has turned into blood, and instead the little Jewish slave gets cool, clear water. You'll travel to a yeshivah of Levi'im in Goshen and walk with lions and bears during the plague of arov. Most important of all, you'll learn the secret of how Bnei Yisrael held on to their belief that they would be freed from slavery, no matter how dark things looked. You've heard the story of Yetziyas Mitzrayim so many times. Now you can really feel it! Author Chaim Greenbaum is the bestselling author of novels like The Will, Fingerprint and The Mexico File. 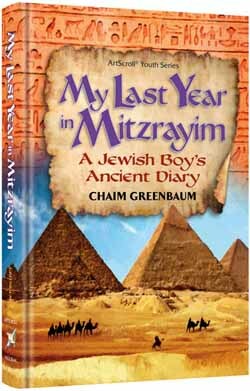 In My Last Year in Mitzrayim, he shows he can write amazing and exciting books for younger readers too!